You are invited to join us at the first annual Texas Yarn Lovers event is this coming Saturday, April 26th, from 10am to 6pm at the Blue Mule Winery in Fayettevile, Texas. If you have a love for all things yarn (or you are even just a little bit curious about it), this is a great opportunity to come out and enjoy a great time sampling, watching, and learning all about yarn. Most of the classes are already full, but the great many vendors are sure to welcome you to their booths and share their love for yarn and fiber arts. There will also be live music, food vendors, yarn swaps, and much much more! You can definitely tell when Springtime has arrived for many homestead bloggers! As the landscape turns from brown to green, the pace of work on the farm speeds up very quickly. For many of us this means far less time is available to sit down at the computer to share our adventures. Here at Whirl’d Works Farm this has included another successful lambing season, trying to get the garden up to speed, fencing in an additional 3 acres, installing an automatic gate opener, and so much more. Among these many activities has been one I am now excited to announce to you today! Winter time is the time for ideas and crafting. We put these two items together this past winter and have come up with a great new gift that you can buy for yourself or someone you know. 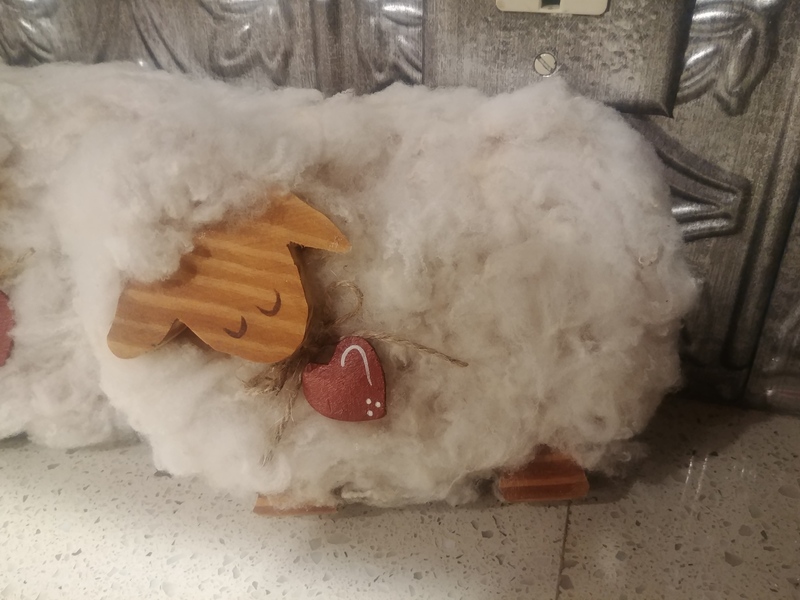 We’ve incorporated our love for both wool and woodworking together and have produced our Handmade Wooden Sheep. We hand cut the wooden shape and then adorn the cute shape with wool fleece from our very own fine-wool sheep. I think you’ll agree that the end result is a cute and charming collectible piece. You can get yours now for our introductory price of only $14.99 (plus $3.00 shipping), but as they say on those wonderful infomercials,”Supplies are limited, so get yours today!” We’ll absolutely be making more once these little lambs sell out, but probably not again until the Springtime rush gives way to the oppressive summer doldrums. The past few weeks on the farm have been incredibly busy! It is no easy task to fence in roughly 3.2 acres, but with the help of our oldest son we were able to finish it a week or two earlier than we expected. As you can imagine, setting aside time to write has been a challenge in the midst of such a big project. Even on the days when we weren’t working late, the mind and body need time for rest. I do have several articles in the works, but this week most of my time will be spent cleaning up after our big success as well as finding and putting away all my tools. 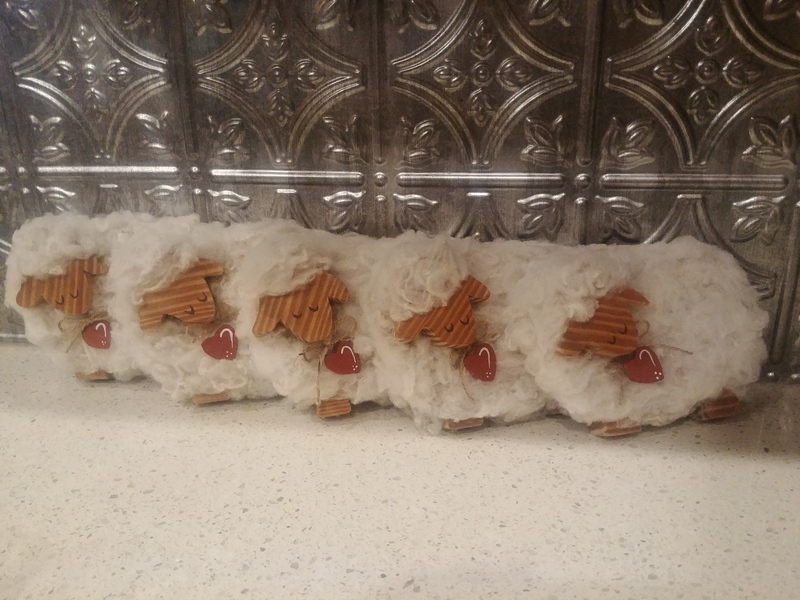 With this in mind, I thought we’d take a little break this week and simply share with you a glimpse of our little flock. Sheep are very much creatures of habit and they really don’t like surprises or new things very much, but the morning this video was made was their introduction to their new field. The chute and gate configuration has changed a little and they weren’t sure they were actually supposed to go through this strange new gate. The easiest way to get them there was to lure them with their favorite tasty treat. (Cameo appearance by our guardian dog Daisy). The next quick video was taken a while ago, but it’s fun to watch and listen to the mommas and their babies. Most often once the sheep are in their pasture they won’t pay much attention to you because they are busy doing other things. But the second one of them spots you and has even the slightest hint you might be bringing treats they will follow you anywhere. That’s all we have for you this week, but I hope you enjoyed this little look into our daily life here on Whirl’d Works Farm! If there was ever one tool I could not do without on the farm it would easily be this little workhorse. I couldn’t even begin to determine just how much fence I have installed since moving onto the farm. With each new year comes greater challenges and many of those are met by putting up gates and fences. This is one of those jobs that can’t in any way be done by short cuts. Fences require considerable tension and if your posts aren’t deep enough in the ground it won’t be very long before the entire fence line needs worked on again. (Yes, I have learned this the hard way). I do see others working on their fence lines in our area with nice 3-point augers attached to their tractors. There have been times when I’ve considered a similar purchase, but honestly, I choose not to because my little blue Seymour works so well for me. When a fence job comes up, all I have to do is walk to my tool shed, grab “little blue” and get to work. There’s no fussing with lining up the PTO, no greasing bearings, and let’s not forget the upkeep on the tractor. In fact, I am pretty certain that if I need five post holes dug, I could do it faster by grabbing this tool than if I had to fuss with a tractor and implement. Would I want to do 50 post holes, probably not, but I haven’t yet run into that scenario. I realize I am at somewhat of an advantage in this regard due to the fact that my soil is about a foot of sandy loam on top of clay with about 1 tiny rock per acre. If my soil was the least bit rocky I am pretty sure “little blue” and I wouldn’t be quite such good friends. With our soil, it takes me perhaps 3 to 5 minutes to dig a 36-inch hole, as long as there is a decent amount of moisture in the ground. During the summer you would need something more along the lines of a jackhammer to get more than a foot deep. The model I have is just slightly different than those available right now. The only difference is that the blade can be set on my auger from 4 inches wide up to 8, but I really find that leaving it set at 6 has been sufficient. What this auger has that post hole diggers do not is the ability to dig very deep holes, perhaps even shallow wells. To do this, the auger head simply screws off and you can add additional shaft lengths to make your auger as long as desired. I’m pretty sure digging a 25 foot shallow well in this method would seem quite a chore, but it is an option that even an expensive PTO auger couldn’t even approach. If you are tired of using those frustrating traditional post hole diggers that take far too long to make a decent hole and leave your hands, arms and back in pain, consider swapping that old tired tool for the Seymour Auger. Homesteading is more about what you do than it is about where you are. When it comes to making entertainment choices, many people in the homestead community choose to either go without television completely or at least drastically reduce their consumption of it. The reasons for such a decision can vary greatly from household to household, but there can be some great advantages from cutting the cord. For us, the decision was actually rather forced upon us. Television had become a way of life for us, like so many families, but once we moved into our new home we soon realized we had zero television reception. Satellite internet was a must for us so we thought we’d just stream shows like we used to on city cable. It took only five minutes of watching the word “buffering” on our screen to realize the bandwidth we were willing to pay for simply wouldn’t cut it when it came to streaming internet TV. We made the conscious decision to try life without television for a while and we have been happily surprised with the results. I’ll not bore you with dry facts or rote figures on this one. What I can honestly share with you is what we have experienced in our own home over the years. We have not always been a low-TV consuming family. For many years the television actually consumed way more time for us than it probably should have. Like so many other families, there were multiple televisions in our home and the family would spread out in the evening watching a variety of different shows. I remember at one point realizing we weren’t spending enough time together and had the bright idea of “family movie night.” We would make vast volumes of popcorn and all sit together watching a show for a couple hours. It was fun watching everyone laugh or jump out of their seats in unison, but once the movie was over, everyone scattered again. Now that we have moved to an area where we get absolutely no broadcast reception and have chosen not to pay the high cost of satellite TV, the time we used to spend each day watching television has been replaced with real conversations, game playing, music, and overall great times together. We still do a movie night, but now it isn’t our only attempt to bring the family together. There certainly are interesting and educational programs on TV, but to be honest, most of the time spent watching those shows, for us, was just another way to kill time. Every now and then some interesting fact or event would transfer from the screen to our memory, but probably not too often. We rediscovered a love for books, and not only that, but a trip to the library has become a new and fun adventure for us. Sure there are plenty of times we’ve picked up a book only to set it down after only a few minutes, but we seldom turned off the television even if a show was boring. If you regularly watch television and later wonder why you can never get anything done, join the club! I don’t have a clue what the statistics are on this one, but I am certain that the biggest reason for not having time for anything else is due to time spent watching TV. We’ve found so much more time for crafts, hobbies, necessary chores and even just spending time getting to know each other. Every tick and tock of the clock is another second you can never get back and the television is an eager thief. Running a homestead like ours takes a lot of work, but there is some amount of free time left for doing other things. In the city those times would often become a ripe field for TV binging. Out here on the homestead, getting to know our land is so much more entertaining. I have found that watching our sheep play or discovering new and interesting plants to be far more rewarding than watching reruns I’ve seen a dozen times before. Cutting the cord may not be for everyone, and like I mentioned earlier, we still make time for movies now and then. We’ve definitely become more discriminatory in the things we watch because it has become a planned event rather than simple happenstance. We really do want to actually enjoy the time we choose to watch television and make a concerted effort to ensure that the videos we rent or check out from the library are good, decent entertainment for our family. Of course the quality of movies in recent years has degraded to the point that we watch fewer and fewer shows. But that’s perfectly alright with us as we have found so many other ways to celebrate our limited time together. Escaping from the big city is a dream that many of us have and one that we have been very fortunate to achieve. Buying land for your homesteading dream may be either far off, or very near. In either case, here are some helpful considerations for you based on our experience (both before and after our purchase). Eliminate Debt: Moving to your dream while carrying excessive debt is a very sure way to diminish the joy of land ownership. Even the most thrifty and imaginative landowners will need to invest in their new property and not having the freedom develop areas can become discouraging as well as potentially dangerous for livestock if ample protection and provision cannot be completed. Climate: Many people decide to buy land right near where they are used to living while others look to a far away land for their new home. Understanding the climate for your new homestead plays a great deal into the decisions made concerning crops, livestock and other important factors. For instance, if you want to go completely off-grid, there are areas where solar or wind power is far more practical than in other areas. Pollution: A potential tract of land may be well priced and beautiful, but nearby mining, drilling, power plants or other pollution factors could lead to a great many disappointments. If a piece of land seems too great to be true, take some time upfront to ensure there aren’t pollution specific reasons. Pollution.org and other resources are available to help you determine pollution levels in a given area. Neighbors: Moving to a brand new area, you may have no idea who your neighbors will be. If you want to make sure potential neighbors are the kind of people you want to live near, consider trying to meet them before buying your land. If your attempt to do so is met with hostility or the like, you may want to reevaluate if that area is for you and your family. Solitude: Most people looking to move onto land are seeking a more peaceful life. When you find a tract of land, consider looking at a satellite view to see if there are any potential sources of noise nearby. An area may seem very serene during a weekday, but if there is a racetrack, military base, or other public venue nearby, the sounds may be very different on the weekend. Another good idea is to visit the area at different times of the week and weekends to listen for potential signs of noise. Building Restrictions: This may not be as important to some people as it is to others, but building restrictions can have an impact on future land values and visible satisfaction. Livestock: If your plan includes raising a particular type of livestock, it is imperative to make sure that such animals are allowed in that area. Beyond that, certain areas are better or less suited for particular animals. We chose to raise sheep and goats and had no idea that the area we moved to has high levels of parasites. We have managed to overcome this challenge through a careful pasture management and de-worming schedule, but it was not something we had originally considered. Business: Many homesteaders desire to establish a home business to varying degrees. Those businesses that require a great deal of online or phone access may suffer in an area where access to these services is insufficient. Satellite options are typically available in most locations, but these services can be expensive and more restrictive than other internet and phone options. Land Management: How you plan to utilize your land is one of the greatest factors to decide before beginning any search. If your plan includes wood harvesting for heat, construction, or other purposes, it makes little sense to search an area void of timber. Similarly, if you desire to grow food crops, choosing land covered with timber could prove a timely and costly decision. Water Source: There is nothing wrong with connecting to municipal water supplies in an area that is served with clean, good quality water, but poor water quality is not something you want to have to fight against. Similarly, if you want to utilize creek, river, lake, or other surface water, understanding the quality of the source is very important. Well water is also an item to better understand. When we moved to our land, we had initially considered drilling a water well. When we had a company come out and discovered that they recommended drilling 800 feet deep at enormous cost, it made much more economical sense to connect to the local water line that ran along our property. Power Source: How you plan to power your home and activities is incredibly important. If you want to install wind generation, but your home is in a valley surrounded by trees, it is very likely you are going to have to change that plan. Connecting to grid power can also be very expensive depending upon how far away the current electric resources are located. Waste Disposal: No matter how resourceful, practical and thrifty you are, your homestead will produce waste. Understanding the rules, regulations and availability of local refuse resources is crucial to a waste management plan. Nearby pollution may not be a problem, but you certainly don’t want to create one of your own. Per Acre: The cost of land per acre greatly determines the amount of land you will be able to buy. If you followed the very first point on this list and eliminated all of your debt, the amount of land you can purchase will be improved. Buying too much land that overloads your budget is a very, very bad idea. Cost of Utilities: Waste removal, internet, electricity, water, and more have a direct effect on the overall monthly cost of property ownership. Fencing: An area that already has good fencing installed will save you far more time and money than you may realize. It is difficult to fully understand how much fencing an area of land costs in labor and in financial cost. Taxes: This is one of those areas that many people overlook, but plays a great deal into the annual cost of property ownership. Living in a rural community located very close to a large city may be affordable today, but that city is likely to grow and that urban sprawl can sneak into your annual tax costs. Some areas, like ours, allow you to claim homestead and agricultural exemptions which help relieve the tax burden. You may be rewarded greatly in understanding the tax implications of your dream land long before signing any contract. Closing the sale: Other hidden costs in land transactions are amounts paid to brokers and agents. If you max out your land purchase budget before understanding the fees of closing the sale, you could find yourself in a bind before ever moving to your new property. There may be even more concerns in choosing land that I have overlooked in this article. It is my hope that although this may not be an complete and exhaustive list, these items will help you understand the complexities involved in buying land. It isn’t as simple as seeing a beautiful plot of ground and signing on the dotted line. Purchasing a future homestead should be entered into with deep consideration so that you end up with the very dream you have long anticipated. Learning about the land we live in is one of the great adventures of our life on the farm and each year the advent of Spring sparks anew this adventure. We do learn a few things over the Winter months, but these topics usually involve finding new ways to enjoy our small home away from the wet and cold. It is when the temperature begins to rise that a sense of renewal begins and the cold, gray trees once more clothe themselves with beautiful green leaves and showy flowers. It was one such tree that caught our attention this past week. We hadn’t noticed it before, but off on the edges of our far pasture we saw the beautiful white dome of a flowering tree. Neither of us know a lot about trees to be able to look at any given specimen and know what it is right away. What could be said about this little tree was that it is shares beautiful tufts of tiny, white, very fragrant blooms. We studied the different aspects of the tree and then set to work on trying to figure out what kind of tree it is. I stress once more that we are certainly not arborists and could be mistaken, but it is our opinion that this little gem is a Mexican Plumb (Prunus Mexicana). If you agree or disagree with our conclusion, please add a comment below to join in the conversation. Here in Central Texas, Springtime began to peek out from behind the gray clouds of winter, but we found it necessary to travel to a land where Winter still holds its strong grip. My Aunt passed away last week and her memorial service was scheduled for the following Sunday. I had missed the funeral for her husband, my Uncle several years earlier and I wanted to do everything possible to ensure I could be there this time. I can assure you though that uprooting my wife, a six year old, and an infant from their regular schedules with little warning is most certainly a challenge. Add to that the complexity of finding a sitter for the farm and quickly showing them the daily routine and I slowly began to wonder if this trip was going to be possible. With a very busy full-time job, there really was no way for me to organize and administrate the sudden changes that would need to take place. Thankfully, God has blessed me with an incredible wife! She not only found and quickly trained a farm sitter, she packed everything all of us would need for the trip, including enough food so we would not have to eat out and bust the budget. We set out for middle America Friday afternoon and only a few hours later realized we weren’t in Texas weather any more. By the time we had stopped for the night there was snow and ice on the ground and when we woke up the next morning, the rear doors to our SUV were frozen shut. It was an unearthly 15 degrees! The further we drove that Saturday, the worse the roads became. We were heading directly for a winter storm! This Texan driver had no interest in learning how to drive in a snowstorm with family in tow, so I kept track of the weather system and road conditions on my phone and kept veering northward to keep from heading too far East, into the storm. It took a little over 100 extra miles and a few hours to get around the winter weather, but we kept the car on solid ground. When we arrived at our destination though, the snow on the ground was deeper than I had seen in many, many years. I wasn’t all that excited about it, but our six year old was more than ready to jump into the drifts. There was a hill behind our hotel that would have been good for sledding, had we a sled with us. He tried to take a run at the hill on the top of our cooler, but it just wasn’t big enough. No matter, he played in it with a huge smile on his face. Then…the snow began to fall. By the time we woke up the next morning, several inches had fallen. Our SUV was covered in snow, as were the roads and everything around us. We were to meet together with family that night for dinner, but I was rather discouraged at the thought of driving. You see, in Texas, when it snows or there is any amount of ice, EVERYTHING shuts down. We simply do not have the equipment, manpower or ability to clear enough of the road hazards to make travel possible. Where we were though, it is a mightily different story. Plows were out in force clearing the roads and laying down salt to melt the snow. It was actually quite a site to see. It was as if nearly everyone in that town who owned a pickup truck had it equipped with a plow and were clearing main roads, side roads and even parking lots. The snow continued falling throughout the night and well into evening the next day, the day of the memorial service for my Aunt. There were drifts almost as tall as our son, but the roads were travel worthy. We all made it safely to the service and celebrated the life of a woman who meant so much to all of us. Afterwards, we were invited to a cousin’s house that evening to go sledding on real sleds. Our original plan was to start heading home right after the service, but even the Herculean effort of the local road crews found it difficult to get ahead of the falling snow. We cancelled our travel plans for the night and headed for some fun in the snow. It was a fun time for all the kids, including this big kid writing this. I had not been sledding since I was a kid myself and couldn’t resist the chance to take a few runs down the snowy slope. We wrapped up the sledding as darkness overtook us and retreated inside for warmth and big cups of hot chocolate. We then said our goodbyes and carefully ventured back to our hotel for the night. In the very early hour of the next morning, before the sun even stretched its arms to welcome the new day, we loaded up and headed for home. There was a LOT of snow on the sides of the interstate, but the roads were clear. It was a mere 9 degrees, but somehow these locals tackled the task and we made our way Southward again. We made it safely home slightly after our regular bedtimes and were thankful for the safe journey to winter and back again.